Is your life going exactly the way that you planned in every single capacity? Were you fortunate enough to identify your purpose in life at an early age and as result been able to create a life of abundance in all aspects? Do you truly feel fulfilled and at peace with the direction that your life is currently going because you know in your heart that your true purpose is being followed every day? If so, I congratulate you. For you are one of the few people who figured out early in the game what your contribution to the world was supposed to be and are reaping all of the tangible and intangible rewards that come with it. If however, you find it hard to relate to any of the above statements and are instead finding yourself in a constant state on internal conflict because you either have no idea why you were put on this planet or at least know that you weren’t put here to do what you are currently doing now, then listen and listen good. My name is Nicolas Baron and sadly, I spent many years of my life encaged in this form of spiritual imprisonment (as I like to call it) that you are experiencing at this very moment. And I know firsthand how frustrating, lonely and scary it can be. It’s almost as if you are spending you entire life trying to swim against a tide that never seems to go your way. And the result is that you never feel complete or experience success in its most organic form. Even in cases where you may acquire money or certain achieve certain goals, you always feel as though something is missing; and there is. It’s called the link to your soul. And unless you have clearly identified your soul’s desire, you can never actually create this link. This is what happens when you are engaged in a lifestyle that is not aligned congruent to your soul’s desire. And until you rectify this situation, you will forever remain in the state of conflict, frustration, fear, confusion, disarray and sadness. Sorry to sound so grim but while truth can sometimes hurt, it is the first step in identifying and rectifying any problem. And whether you choose to realize it or not, this is a problem. In fact, I can’t really think of anything that is more problematic than spending your entire life moving in direction opposite to what the inner you really wants. It took me years to realize that I had this problem. In fact, at one point, I had even convinced myself that my purpose in life was to not know what my purpose was at all. This was how warped my reality had become as a result of constantly engaging in activities that didn’t serve my higher purpose. This was not at all the way it was supposed to be; especially for me. You see, ever since I was child I was fascinated about the human experience on earth which we know as life. I often wondered why we are all here and what we are all supposed to be doing. I wondered about my destiny and if there was any way that I could influence it. By the age of ten, I was attending and Ashram where I began practicing Transcendental Meditation and getting to know different people from all walks of life. As I learned more about people from different cultures, my vision about life and what it all meant really began to take shape. And with that came my desire to learn more about life purpose. Realizing the power of the mind, I took every necessary step toward enhancing my thinking process and how I utilized my mind on both a conscious and subconscious level including becoming a hypnotherapist and a qualified practitioner of Neuro Linguistic Programming or NLP. I read every book that I could get my hands on, listened to every audio program and spend thousands of dollars attending seminars. I was armed and ready to take on the world with all of my new found knowledge but in the process, I also needed to make a living. After all, how the heck was I supposed keep a roof over my head while I was figuring out my calling in life? I was not ready to become some starving artist who lives in the street begging for change while following my dream. I had bills to pay and quite frankly I kind of like sleeping in a nice, warm bed as opposed to the cold concrete streets of Australia! And so I kept my day job with the intent to discover my life purpose during my spare time and begin following my dreams. And so the cycle began…. The cycle that I speak of is when you are so entrapped in the obligations that you must fulfill in order to maintain the state of your “current” life, that you wind up flushing your dreams down the toilet. You take a job because it includes one more aspects that are beneficial to you like a good compensation or benefits package, travelling privelieges, etc. As you become more valuable to the company that you work for, you are giving more work to do; with of course more pay to keep you chasing the carrot. Eventually, opportunities to work for other companies with better compensation packages begin to surface and you move on. The Next Thing You Know, You Wake Up To Go To Work 20 Years Later And Realize That You Spent The Past 2 Decades Contributing To A Higher Purpose Alright; The Only Problem Is That It Wasn’t Yours! And that’s exactly what was happening to me. I was in essence, serving the needs of other people’s souls. I was helping other people fulfill their life purpose which I guess could be considered a noble thing to do but it did nothing in terms of making me completely fulfilled. And that’s when I decided that I needed take make a change immediately. I needed to take all of that information that I had spent years acquiring and actually begin putting it to use. I still wasn’t exactly sure of what I wanted to do with the rest of my life but I did know one thing for sure….I didn’t want to work for someone else ever again. I wanted to call my own shots and live life on my own terms without ever having to answer to anyone else other than myself for the rest of my years on this earth. It was at that very moment that I began to realize what my life purpose was after all. I decided that if I could take the all of the knowledge that I had attained over the years and develop a system for people to discover their life purpose which would serve all of their internal needs in the most abundant ways possible; then I would truly feel that I was fulfilling the mission that I was put on this planet to take on. The Power Of True Purpose - You’ll clearly identify your very own purpose in life and stop drifting through life aimlessly. Three Simple Steps To Purpose - You’ll find out why everyone has a life purpose and how easy it is to determine your life purpose. 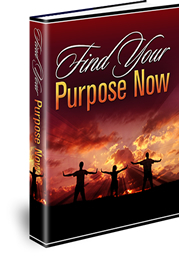 With three easy steps, you’ll learn how to find your life purpose today. Goal Setting Mastery – Here you’ll not only recognize the importance of goals and goal setting, you’ll discover a sound system for actually bringing them to life. The Essential Component To Achieving Goals – Once you’ve mastered the process of goal setting the way it should be done, you will learn how this critical yet highly underutilized tool will propel you toward your goals. The Power Of Laser Focus – Businesses and Professional Sports Teams always move forward with a strategic plan...Why shouldn't you? Without clarity your strategic plan will plunder. Here I’ll share some of my most treasured gems for developing laser like focus. The Passion Driven Career - How to find a career that you are passionate about, develop career objectives and get the most out of your career aspirations. The Path To Meaningful Relationships - You’ll be more engaged and committed to your partner, family and friends leading to fulfilling relationships. The Key To Attaining Optimal Health - Your troubles will seem to vanish as your stress levels decrease because you’ll know what you want and MOST importantly how to get it. A Higher Level Of Consciousness- Become more attuned and develop awareness of the opportunities all around you. You’ll become skilled at identifying and drawing out opportunities that help you fulfill your purpose in life. The Power Of A Positive Attitude - Learn how your attitude can catapult you toward success or push you back to the patterns of failure and frustration. You’ll discover how your attitude has a direct impact on your outcome and your success, and the secrets of how easy you can choose your attitude. Thee Unshakeable Belief System That Already Resides Within You - Learn how to create a belief system that will develop your self confidence to pilot you through your day and shatter those self-defeating patterns that are keeping you on the sidelines of life. The Dynamic Of Transcendent Success – Watch the influential effect that the power of your success has on others, and how they will in turn help you advance your dreams and fulfill your life purpose even further. Now, if you are looking for some long, drawn out, overcomplicated answer to the questions you have been asking yourself about life purpose in the form of some “fluff-filled” book that will take you ions to read, then you are not in the right place. And the best part is, it’s designed to equip you with the empowering tools you need to discover your life purpose within ten minutes using just 3 simple steps. Because the truth of the matter is if something works; it works. It doesn’t need to be some grueling process that is going to make you quit half way through to instead go watch the television. Instead, you will get exactly what you are looking for in an easy to apply, step by step formula that will change your life….and you might even have some fun in the process. 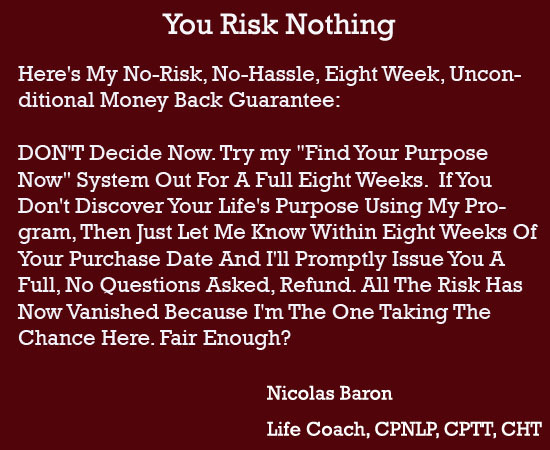 But just in case you have some preconceived notion that I am either taking you for a ride, out of my mind or have no idea what I am talking about, I will let you try my formula with absolutely zero risk. I think you can clearly see which option will be the most beneficial for you. But just in case you don’t, let me now combine the benefits with an outstanding value! The basis of effective creative visualization is “imaging”. Imaging is a very precise methodology that has the power to transform your life as it has transformed the lives of hundreds of thousands of others. Simple, easy, and step by step method to visualize creatively and guarantee your results to get there! Your no-fluff, straight to the point, easy to follow guide and inspirational ways to eliminate stress which creates diseases and illnesses, and regain your healthy life! The ultimate self-help manual to building your character in order to face adversity, learning how to break bad habits, and adopt good ones, is one of the single most powerful traits of successful people. Your clear and concise Self-Empowerment Guide where you'll explore some of the easiest, quickest, and most effective NLP techniques available to create empowering personal changes. The Complete Shape Your Purpose System Is Only $27.00! Now that you know exactly how this empowering resource will change your life and you can clearly see the outstanding value that I am practically giving away, do yourself favor and take advantage of this unparalleled opportunity right now! Learn how to attain your goals and your life purpose with the power of envisioning what you want. 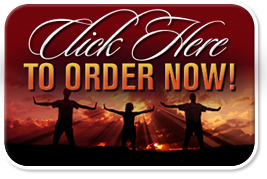 Dare to want it all, discover how to make it happen with just the power of your thoughts!